An ideal place from where to climb this peak is the VOC (Varsity Outdoor Club) Harrison Hut. 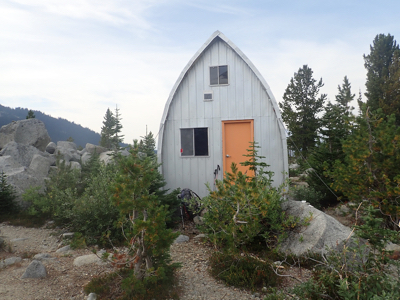 The club has done a great job establishing a trail to this hut from a trailhead that may be reached via a forest service road (FSR) called Lillooet South FSR. Locate Pemberton along Hwy. 99 (north of Whistler). At Pemberton Portage Rd turn left. Follow the road to a roundabout where you go left onto Birch Rd. At the end of Birch Rd make a right onto Pemberton Meadows Road. Continuing on this road 9km past the Lillooet River FSR turnoff leads you straight to the start of the Lillooet South FSR. One should drive about 23.7 kilometer on Lillooet South FSR. Note that there is a gate after 2 km and a second gate at 23 km. These may be locked in which case accessing this trailhead will be difficult. There seem to be no reliable information about this issue (policy). If there is active logging activity vehicles may be driving in in the morning and back out in the late afternoon. One may then be able to access (in/out) at these times. A bit after the gate at 23 km, one should turn left forking off the main valley road. This road now climbs the hillside, them a pretty long traverse. Stay on the main road avoiding various ´forks serving logging purposes. The trailhead is clearly marked with a sign, there is parking for a few cars. This location is N50.60031, W123.40692, elevation about 915 meter. The trail is pretty good and marked with colored (reflective) markers on the trees. First, (2018) there is a temporary detour, a bit cumbersome, in order to avoid a logging area. Next, the trail runs along the fairly steep hillside with several sections gaining and losing some elevation. The trail eventually joins an old logging road, then hits what appears to be a newer logging section (2018), before re-entering the forest. You will turn a ridge, then descend to a pretty wide river, lots of rocks, but limited water. Easy to cross under normal conditions. Two more rivers are crossed on bridges, the last one has a new bridge higher upstream while the lower bridge has been destroyed. One should note that the trail markers lead to the correct bridge, while the most visible trail heads straight to the damaged bridge. The trail climbs more consistently at the end, reaching a last river that may be crossed on big stepping stones. The Harrison hut is now only a few meter away. This hut is very nice, with a wood burning oven and basic equipment. One need to bring a sleeping pad, a sleeping bag, as well as food and a stove for cooking. The hut location is N50.52064, W123.43189, elevation 1715 meter. Note: The river next to the ´hut has glacial water, not good for drinking. We searched for and discovered a nice clean water supply. Return back across the creek, follow the trail a short stretch downhill. Just as the trail turns left to cross a small ridge-line, proceed more directly downhill, then slightly right. The water source is under a pretty large boulder, just as the hillside levels off a bit. (The foot of a reentrant). One should access the lower end of the glacier that drains to the river running very close to the hut. Initially, the terrain is covered by big boulders, proceed a bit to your right in order to find a reasonable route. Pretty soon, one may move back near the main drainage and pass the small lake pretty close on the right hand side. Ascend more steeply among rocks and smaller cliffs to arrive at the glacier at or near location N50.60031, W123.40692, elevation about 1930 meter. Proceed up the glacier. First, a climbing traverse right, then straight upslope. Higer up, do a climbing traverse left in order to make the pretty distinct col, ie. the lowest possible crossing to the glacier on the other side. From this col, head north, descending to about 2210 meter, then contour right and ascend the glacier on the south side of Overseer until you reach a level area. From this area, we climbed onto the south ridge of Overseer. This ridge may now be followed all the way to the summit. There is plenty of scrambling, YDS class 3. Most of this may be avoided by going on the side, mostly left as you head uphill.